The concept of Auroville – an ideal township devoted to an experiment in human unity – came to the Mother as early as the 1930s. In the mid-1960s the Sri Aurobindo Society in Pondicherry reached out to Her that such a township should be started and in February 1968 some 5,000 people from 124 countries and every state of India attended the inauguration ceremony. The Unity Fund has been established as the primary channel for all income into Auroville. Location: Auroville, Tamil Nadu and some parts in Puducherry UT. Project Name: Udavi School: Construction of Two Rooms for Staff Residential Accommodation, and, Storeroom for Sports Equipment. Udavi School started in 1981 as a Creche (Balwadi). Slowly it grew and in 1995, it was recognized as a Matriculation School and since then it has been functioning as such to cater to the rural population in Tamil Nadu. It has about 220 students from Pre-creche to Matriculation. It aims to give a high quality education to the children from disadvantaged families that come to school from nearby villages. It ensures all round development of personality of the children and infuses them with high ethical values. IDRF has been supporting ‘Udavi School’, Auroville, Tamil Nadu over the past decade and aims at imparting the vision of Sri Aurobindo and the Mother. Children’s formal education is supplemented by an array of activities: clay work, dance, drama, music, carpentry, tailoring and art work. 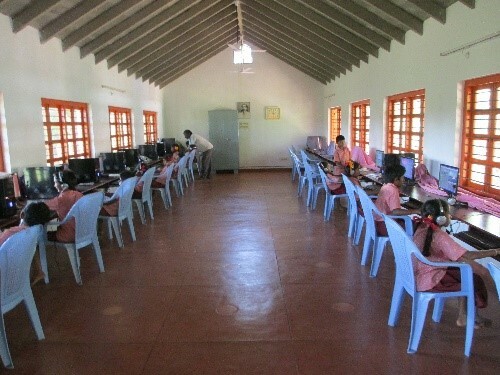 IDRF’s grants have met varied needs such as construction of compound wall, library building, staff quarters, dorm-room furnishings, and computer and math labs. One of the principal challenges faced by the school is to find good teachers. The school is located in a backward area and teachers are not easily available from the local population. One of the incentives which help teachers and volunteers to come and work in Udavi School is to provide them with residential accommodation. With IDRF’s support two additional rooms on top of an existing building are being constructed. This will help in getting young and volunteer teachers to work in this school. Please click on the link below to watch a video on Udavi School and the enthusiastic students from disadvantaged families discussing their future professional plans!